“There are only two sights worth seeing in Plymouth, one is the Hoe, the other is Bogeys”. David Knight, pictured above, described how his grandfather Harold, and his grandfather's brother William, both established the business back in 1897-98, in Charlotte Street. At first Knights was a furniture removal business; the brothers knew Pethericks very well, another well-known company who also started a removal business in Devonport around that time. Both companies used horses to carry out their work. At some point Knights removal business was asked to move ammunition and rum barrels for the Navy, following which the brothers, together with their sons who had then joined them, started the H & W Knight Surplus Stores. 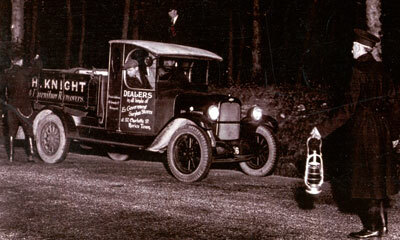 By 1928, when motor lorries appeared in the UK, Knight removals became the owner of the first Chevrolet lorry in Plymouth - that very lorry can be seen in the picture below. The photo shows the lorry being stopped on Dartmoor by police - a prisoner had escaped from Dartmoor prison and all vehicles were being searched. David is rightly proud that you can clearly see the name Knight on the side. The vehicle is evidence that, for a while, Knights operated two types of business simultaneously, a Family Removal company and a Retail store (of government surplus). The writing on the side of the lorry is part-blocked from view by the policeman but can be interpreted as being 'W & H Knight Family Furniture Removers'. The writing on the door is 'Dealers in all kinds of Ex Government Surplus, Stores at 52 Charlotte Street Morice Town', Then there is some writing on the vehicle side panel, but only the address is readable - 14 Granby Street, Devonport. Clearly, at this period the Knight family were already very successful business persons operating from various addresses in Devonport. Although Harold didn't die until 1968, his son Arthur (David's dad) appears to have taken over by 1940, when he continued the Government Surplus stores in Cumberland Gardens. 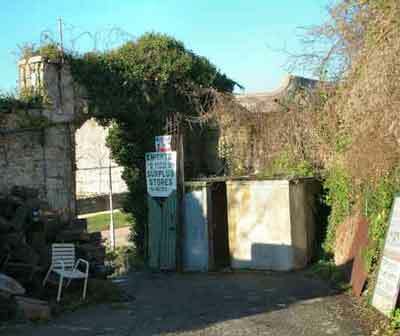 By 1953 the company had moved once more to its present site at Mutton Cove. Nowadays I doubt if there is one single household in Devonport that has not heard of this charming and fascinating Aladdin’s Cave – nay further, to Plymouth and beyond. I’ll even wager that you could walk into any bar in Gibraltar and someone there will have heard of Bogey’s! The Royal Navy Salutes Bogeys. Arthur would delight in telling his customers that the British Navy always saluted Bogeys, every time a ship passed Mutton Cove on its way out to the Sound. To prove this, each time a ship actually did pass, having just left the Naval base, Arthur would rush outside, trailing his customers behind him, rush to the nearby waters edge and stand and take a salute. Sure enough, as his customers would witness, there lining the decks of every Naval ship that passed before them would be row upon row of spick and span sailors, rigidly saluting to shore, pennants flying, ships horn sounding. There was no arguing with that was it? David was grinning at thought of his dad telling customers this story. Yes, the Fleet would be saluting to shore, all as described, and I myself have witnessed this many times but they were saluting the Admiral who lived but a few hundred metres behind Bogeys. 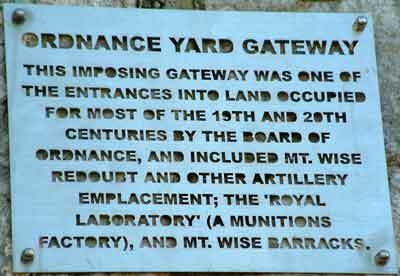 That is, nearby Admiralty House was the residence of the Flag Officer - and the Flag at Mount Wise was always saluted by passing naval ships, until 1996 when the post of Flag Officer was disestablished. It's a great tale though. David Knight began working with his dad straight out of school, as a boy of 15; he has never had any other occupation. Although he has now established a second store in Stonehouse the Mutton Cove site seems to be David’s first love. "When we first came here there were horse stables down against the front wall", said David, "this was the stables yard for the mount wise baracks - and there are stairs going up through to the next level above. but they're not accessible any more, the city council concreted in the top of the stair case, for safety, as people can walk on the land above the staircase." I asked if anyone famous had ever used the store? “Sir Robin Knox Johnstone, the famous sailor, shops here all the time. Another well-known sailor, Chay Blyth also shops here, and the mother of Lord David Owen used to shop here a lot at one time." Knight Surplus. Large stocks of Genuine Army Surplus, Police, Navy and General Military Clothing and Equipment. 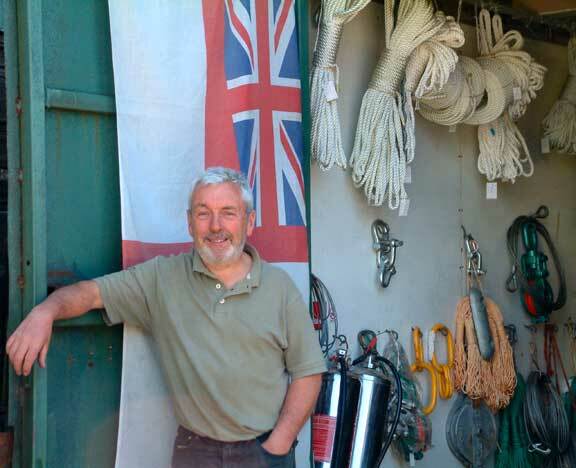 New and Used Chandlery for Ships and Boats. 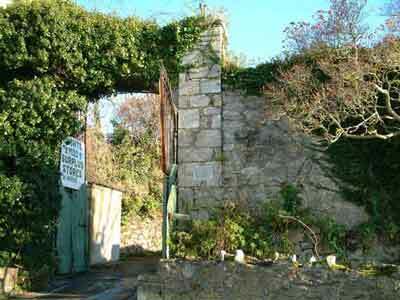 at Mutton Cove,and is now the entrance into Bogey's yard. A close up of the plaque on the right-hand side of the entrance arch. Here is the arch viewed from the inside.